Vinyl has long held a special place in the hearts of music lovers, especially those who spin and mix their own beats in clubs. 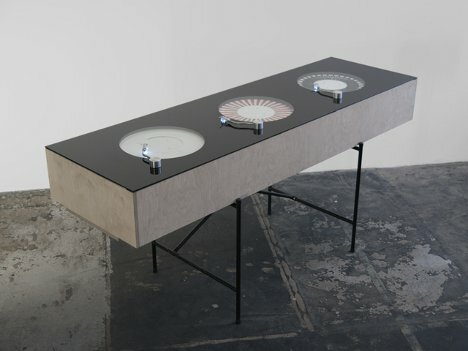 The Soundmachines optical turntables give a similar kind of physical experience, if maybe not the same kind of sound, by replacing the records with patterns of light and the needles with optical sensors. 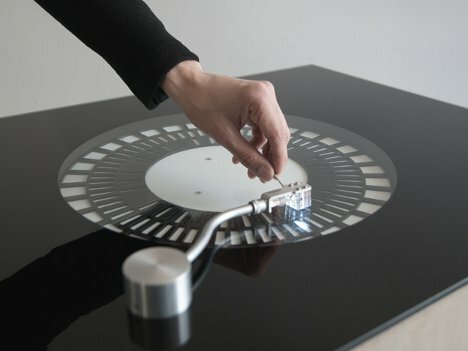 Created by design team The Product for Volkswagen’s display at the 2011 IAA motor show, Soundmachines has three turntables spinning discs of geometric patterns. Optical sensors on the end of the arm – right where the needle sits on a standard turntable – pick up the patterns and translate them into signals that are run through software to turn them into unique music tracks. The resulting setup is positively beautiful, but there’s little chance it will ever truly replace the good old fashioned vinyl-and-needle method or even the newer fancy-pants non-scratching laser turntables. Still, we’d love to get our hands on this awesome toy for a couple of hours.